You know what day it is? The last day of Nano Poblano 2018! How the heck have I managed to write a post every day for the whole month of November?? I was almost not going to write today. I have this thing about not wanting to finish things (like, I have trouble forcing myself to drink the last sip or eat the last bite), so finishing this month out feels… uncomfortable. I have gotten so many new folks reading my blog and so many wonderful comments. I promise to reply and interact more, but right now I need to go into my introverted hermit mode. Will be back soon! 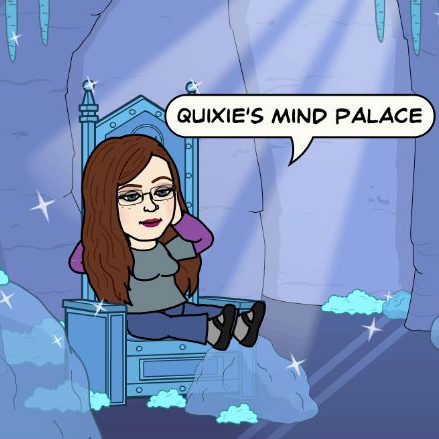 I’m going to miss your daily blogs Quixie. I enjoyed looking out for them each morning. You’ve done well. PS. Re food/drink.. I have the opposite problem..feeling like I have to eat every last bit. I’ve been working the late shift so I have time in the mornings to run errands and part of that is making blogging a priority so I may still be able to blog frequently. But would you believe I have to work until CLOSE, which means I am now working at least 4 10 hour shifts plus an additional 8-10 hour shift on Fridays??? I don’t think I can keep this up and they won’t let me change back. so hopefully I’ll hear back from that potential job. I called off sick today because working overtime is stressing em out (my last paycheck was very nice though because I get paid time and a half any hours over 40). Writing a post every day for the whole month of November? Wow!!!! I know, right? Yeah, it was certainly tough!